Email has become THE mission critical application for businesses large and small. As a growing business continually striving to increase productivity, collaboration and corporate success, you understand the important role that Microsoft Exchange Server plays in any profitable business. Small and mid-size businesses alike see the productivity benefits of utilizing an enterprise-class solution but since many do not have the financial or human resources to bring it in house, more and more of them are turning to a hosted solution. 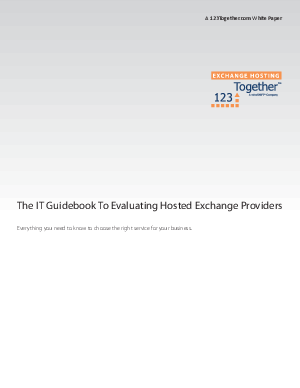 This white paper will provide you with the information you will need when speaking with hosted Exchange providers to ensure that you select a provider who is reputable and will recommend a solution that will help increase your corporate profitability and success.